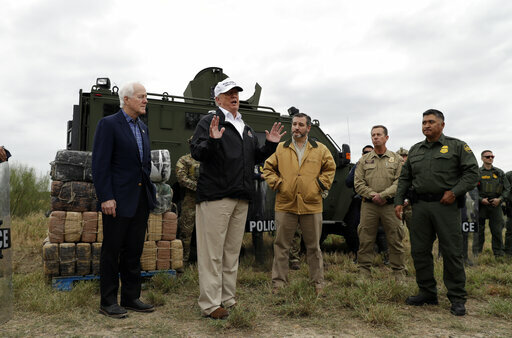 By Miriam Valverde on Thursday, January 24th, 2019 at 3:07 p.m.
President Donald Trump's arguments for a border wall at the U.S.-Mexico border generally center on two themes: the dangers and costs of immigrants. Often the facts behind those claims are either inaccurate or unsubstantiated. Here’s a rundown of Trump’s repeated mischaracterizations of immigration issues. Trump: "There’s a growing humanitarian and security crisis at our southern border." There is crisis, but it’s about the asylum system, not people pouring across the border, experts say. The overall number of people caught at the southwest border is not at historic high levels. During Trump’s time in office, overall apprehensions have been below 400,000; there were more than 1.6 million apprehensions in fiscal year 2000. Illicit drugs mostly enter through legal checkpoints, not in between points of entry. Several studies also say that immigrants (regardless of immigration status) are not more prone to crime than native-born Americans. Trump regularly contends that immigrants coming in illegally will increase crime in the United States. The most pressing problem, researchers say, is the country’s backlogged system for dealing with asylum claims from migrants. Once immigrants are in the asylum process, it can take years for their cases to be decided. That lengthy waiting period is what creates the biggest incentive for people to come to the United States, knowing they’ll be able to stay for at least some period of time, an immigration expert told us. Trump: "The building of the Wall on the Southern Border will bring down the crime rate throughout the entire Country!" This assessment clashes with research from criminologists who say that for the most part, people who migrate are a self-selecting group who want to avoid getting in legal trouble, and rather better their lives and provide for their families back in their home countries. There isn’t consistent, national data tracking crimes committed by immigrants in the country illegally. But some studies say that immigrants are less likely to commit crime than people born in the United States. "The research shows that immigration is associated with decreased crime rates at both the city and neighborhood levels," said a 2015 study from the National Academies of Sciences, Engineering, and Medicine. Trump: In 2018, there were "17,000 adults arrested with criminal records." The number comes from Customs and Border Protection. But many of these people stopped at the border in 2018 had criminal records for previous attempts to enter the United States illegally, or other nonviolent crimes such as illegal drug possession and trafficking. The majority were trying to cross at legal points of entry. They were not trying to sneak across the border. So Trump’s wall wouldn’t have made a difference. Trump: "Every week, 300 of our citizens are killed by heroin alone, 90 percent of which floods across from our southern border." The numbers add up, but heroin isn’t being carried across untended border areas. The majority of heroin is smuggled past immigration officers at legal points of entry. It mainly comes in through private vehicles followed by tractor-trailers, where the heroin is co-mingled with legal goods. In 2016, there were nearly 300 heroin-related deaths a week. In 2017, heroin from Mexico accounted for 91 percent (by weight) of the heroin analyzed through a Drug Enforcement Administration program that examines heroin samples to identify the geographic area where they were manufactured. Trump: The United States loses "250 Billion Dollars a year on illegal immigration." That’s False. The White House hasn’t provided evidence to back Trump’s claim, and even the largest estimate we found on this topic is significantly lower than Trump’s number. The right-leaning Federation for American Immigration Reform in 2017 estimated that the local, state, and federal cost of illegal immigration was around $116 billion a year (after factoring in tax contributions by immigrants here illegally). But the group’s periodic estimates are largely criticized for relying on broad assumptions, inflating the number of immigrants in the country illegally and undercounting immigrants’ tax revenues. Trump: Democrats are the party of "open borders and crime." Trump falsely equates Democrats’ opposition to a border wall to opposition to border security. Democrats support adding Border Patrol agents, drone and other technology surveillance at the border. Democrats say a wall is not the most effective tool to deter illegal immigration nor to stop drugs from coming into the United States, because many immigrants arriving at the southwest border are turning themselves in to Border Patrol agents (not running away from them) and most of the drugs coming in from the southern border are smuggled at legal ports of entries, not in between. Trump: Says Democrats "want to invite caravan after caravan of illegal aliens into our country. And they want to sign them up for free health care, free welfare, free education, and for the right to vote." This is False. Democrats say immigrants who want to apply for asylum should be allowed to exercise that right afforded under the law. It’s a stretch for Trump to say that’s an invitation for caravans to come to the United States. Immigrants who are in the country illegally are generally barred from public benefits, but under the law, can receive emergency medical care and other limited assistance. Immigrants granted asylum become eligible for Medicaid and other forms of government assistance, because it’s allowed by law. Trump: Says Democrats previously supported a physical barrier, but "they changed their mind only after I was elected president." Some Democrats voted for the Secure Fence Act of 2006, which authorized building a fence along about 700 miles of the border between the United States and Mexico. That’s the majority of the barrier in place today along the southern border. However, Trump has mocked the fence as a "nothing wall," and it was far less ambitious, both politically and physically, than the wall Trump wants to build now. Trump also claimed that Democrats no longer support their previous position simply because he wants it. But Democrats have proposed current funding for the fencing approved in 2006. Trump: "Mexico is paying for the Wall through the new USMCA Trade Deal." This is not accurate. The Trump administration has renegotiated the North American Free Trade Agreement, but the updated trade deal is not in effect yet. It hasn’t been approved by the U.S. Congress, and it also needs legislative approval from Mexico and Canada, the other two parties in the agreement. The renegotiated deal does not add new tariffs on goods coming from Mexico to the United States, and it’s unclear how the deal will impact U.S. businesses revenues. If U.S. tax revenue increases in response to increased revenues of U.S. firms, then Congress would still have to allocate that money for the wall. Trump: "When I say Mexico is going to pay for the wall, that's what I said. Mexico is going to pay. I didn't say they're going to write me a check for $20 billion or $10 billion." That’s False. In an April 2016 memo, Trump’s campaign outlined the steps he could take to get Mexico to pay for the wall. The memo proposed restricting remittances sent by Mexicans in the United States and urging the Mexican government to pay a lump sum to the United States to pay for the wall. If Mexico paid, the regulation restricting remittances would not go into effect, according to the campaign plan.